Crafting a festive Thanksgiving centerpiece doesn’t have to be a headache. Sok Sun Russell, a retired floral designer and gardener based in Stafford, Virginia, tells us how to create a stunning addition to your holiday table. Russell sold floral arrangements, centerpieces, wreaths, and other floral designs for over 20 years. All of her designs used autumn or holiday pieces, such as dried flowers, picks, greenery, etc. As a gardener, she grew and dried her own flowers for use in her arrangements, including fruits, gourds, cotton bolls, and greenery. She is originally from South Korea and keenly observed Asian conventions with an affinity for nature and the seasons. For example, gourds are always indicative of autumn, and pine is always indicative of winter. Each of her pieces reflected the seasons and deeper meanings of wealth, abundance, and the fleetingness of life. 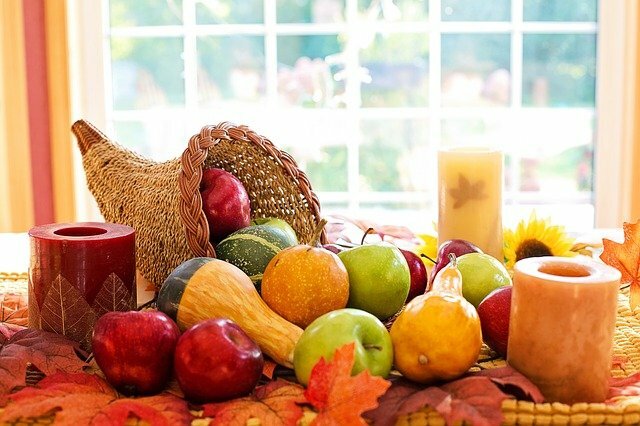 There are many options to consider during Thanksgiving preparation, especially when it comes to the centerpiece. Whether you opt for a functional and festive piece made of fruits and vegetables, a floral arrangement, or something simple and uniquely beautiful, creating the perfect addition to your tablescape doesn’t have to be difficult. Select a basket that fits with the decor of your home. If your home is rustic, with lots of wood accents, a roughly woven basket will match the style nicely. If your home is more modern, try a wide, shallow copper bowl. And of course, a cornucopia basket is a classic choice for Thanksgiving. Low and shallow vessels are often best, as you don’t want anything too big or obtrusive at your dinner table. Select good, natural-looking pieces. A slightly imperfect fruit or vegetable adds to the authenticity of your Thanksgiving centerpiece, but avoid bad spots that will make it spoil faster. Russell also notes that you should wash the fruits and vegetables, and slightly buff them when drying. This will increase their natural shine, and make for a stunning, edible Thanksgiving centerpiece. Fill the bottom of the vessel with Spanish moss, available at most craft stores. Wait until your table is set and then arrange your centerpiece. This will save you from having to rearrange your table every time you move the centerpiece. Place your larger fruits and vegetables at the bottom (or interior) and smaller pieces outside or on top. Try to build a low, mounded pyramid. Remember to look at your centerpiece from all sides as you arrange it, as every guest will see a different side. If you so desire, you can add decorative picks (available at craft stores) to add more flair. Popular picks feature a turkey, pilgrims, and the like. Floral arrangements also make for a beautiful Thanksgiving centerpiece. However, it is important to note that they require a little more preparation, and careful color consideration. You can mount fruits and vegetables on floral picks and use them in your arrangement as well. These make excellent focal points. Give dried flowers a gentle shake before using them, in order to dust off fallen pieces. You can augment dried flowers with silk flowers and decorative picks as well. It’s not necessary to build a floral centerpiece at your table. You can do this well in advance and store it until you’re ready to start setting your table. Insert a block of floral styrofoam in your vessel. Line the entire bottom and try to wedge it in to keep it stable, or glue it down. Cover the styrofoam with glue and Spanish moss. Insert your dried flowers or picks in three different focal points, evenly spaced from each other. Fill in with leaves, greenery, or dried statice. It may take some practice to come up with a design that you like, but everything is reusable and the floral styrofoam allows you to easily reposition the flowers as necessary. Keep at it until you find an arrangement that you really like. And remember, the only way to get better is to practice. If you want something ultra simple and sleek, Russell recommends a potted ornamental cabbage. Perfect for the season, and accented beautifully with a ceramic pot, an ornamental cabbage can serve as your centerpiece and then as a lovely house plant for the rest of the year. You can also try ornamental kale. Remember that a centerpiece can be more than a decoration; it can be a source of inspiration and a reminder of our blessings as we celebrate the season of thanks. Use that to guide you as you build your perfect Thanksgiving centerpiece.